Kawasan Konservasi Mangrove dan Bekantan (KKMB) or Mangrove Conservation Area and Proboscis Monkeys as tourist destination also has another function as the lungs of Tarakan City and as a fortress to protect the city from sea water abrasion. In this Mangrove forest is also be a natural habitat of mangrove trees and typical fauna of Tarakan. The trees are in the Mangrove Conservation Area and Proboscis Monkeys has the average old tens or even hundreds of years. Mangrove forests also serve as a living laboratory that is used by researchers both from within and outside the country. Research results are very useful for science. The existence of endangered species Borneo endemic that are protected, namely Proboscis Monkeys (Bekantan) that live freely, hanging and jumping from one tree to another. Proboscis Monkeys or long nose monkeys by population of Tarakan call “Monyet Belanda” or Dutch monkey. Mangrove Conservation Area and Proboscis Monkeys (KKMB) situated at Jl. Gajah Mada, Tarakan, North Kalimantan. Mangrove Conservation Area and Proboscis Monkeys lies at the heart of Tarakan City make the tourist area are easy to find. From THM Simpang Tiga complex you can use public transportation only takes about 5 minutes. You can also reach this Mangrove forest by foot. Location of Mangrove Conservation Area and Proboscis Monkeys directly adjacent to the Gusher market complex which is the center of economy Tarakan and cold storage industry area also Tengkayu II port. 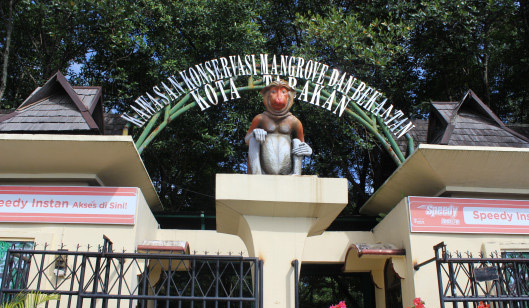 The uniqueness and charm of Mangrove Conservation Area and Proboscis Monkeys not only offers "Dutch Monkey" but also panorama blend the sea and the dynamic natural atmosphere mangrove forest with all the wealth of flora and fauna. Panorama is different that each has its own beauty. In Mangrove Conservation Area and Proboscis Monkeys there are also a gazebo and resting area. Many activities that you can do in the Mangrove Conservation Area and Proboscis Monkeys (KKMB). Ranging from learning activities, study or just enjoy the beauty of this region. There are some unique things that you should not miss. The first panorama when the water recedes, we can see the beauty of mangrove trees on the top of tree to the roots dangling grip the ground muddy. Meanwhile, the proboscis monkeys and long-tailed monkeys play in the roots of mangrove trees while looking for fish and crabs. The crabs are a variety of colors can be found around the river in the middle of KKMB. When the water receded we can also observe the unique fish known as fish Mudskipper or tempakul (local name) jumping, fighting, hiding in the mud. If you are lucky can also meet with "mini komodo", lizards, which can reach about 2 to 3 meters, were crawling in trees or behind the mangrove roots. The second panorama when the water began to tide approximately as high as 60 cm from under of the beach. At that time, we could see the sea snakes swim, fish, and other marine life that particular time we can see. It is also a good time for visitors who are interested in getting a unique experience that is memorable, which catch crab with traditional "ambau". Ambau is a kind of crab traps are simple but practical. The third panorama when the tide is rising up to about 10 cm below the bridge ironwood. We seem to be in the ocean between the stand of various species of mangrove trees are beautiful.